Our bed and breakfast guest who left yesterday after staying with us for ten days saw moose in our yard several mornings from our dining room breakfast table. Finally they came to breakfast with their camera. I told the guests I thought they had more than their quota of moose sightings. The cow and her two baby calves have been making the rounds in our neighborhood this fall. This is the same cow we saw earlier this spring right after she had her babies. 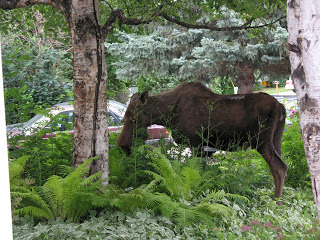 Here is the picture of the moose in our front yard. This entry was posted in Uncategorized and tagged moose by admin. Bookmark the permalink.